A game of two universes. So what next? After the first 45 minutes of the game against Spurs, I was already thinking of what the title of my post match thoughts would be. I was immersed in how I would praise Arsene as the best manager this club has ever known (that hasn’t changed mind you), how I would shower accolades on Cesc for a vintage midfield performance, commend Nasri for fighting spirit, Cham29 fir striking instincts as so on. My facebook status at half time suggested that we were almost there and all I needed was a repeat or near repeat of the previous 45 minutes. But what did I get? “Inability to kill off games after taking the lead, allowing the opposition back into the game. 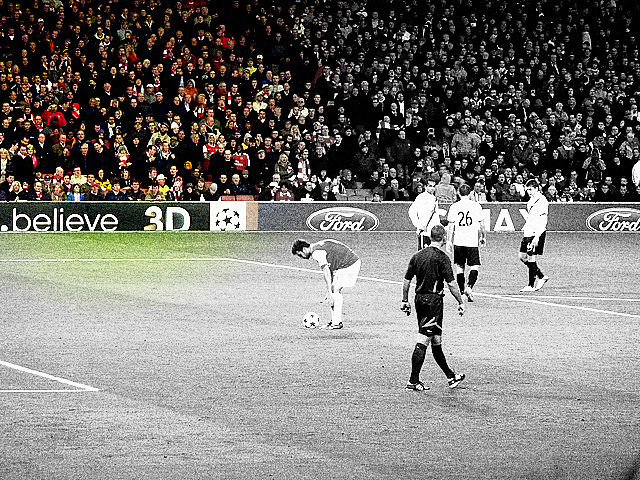 E.g Arsenal-Spurs (20th November, 2010). See also: Arsenal-Spurs (31st October 2008), Birmingham-Arsenal (27th March 2010), West Ham-Arsenal (25th October, 2009)“. The disaster began when we lost the ball after taking a free kick, and Spurs launched a counter and the ball fell to Bale who finished nicely. Then Cesc had a moment of pure madness when he was penalised for a raised arm in the box, VDV struck the resulting penalty with aplomb. Then from a free kick, Kaboul headed past Fabianksi in between Cesc and Squillaci. Game won, Spurs had completed a magical comeback and won at our home for the first time in 17 years. While I am not one to put blame on people, I think Wenger got a few things wrong. I still do not understand why He took off Nasri for an ineffective Rosicky. Nasri had everything to play for, a feud with Gallas was extra incentive, I doubt any other player in the squad will have the determination to score the goal did. It was evident form his celebration that he wanted to win badly and did everything to get the ball in the back of the net. He also brought on an unfit RVP for Cham29, and Walcott for Arshavin. Overall, his subs were ineffective and below par. The defenders had a nightmare of a game, and Koscly in particular was found wanting many atimes. The Squilacci-Djourou combo showed great promise and I still don’t understand why they were not paired again. Cesc had a game to forget, Clichy and Sagna did little going forward and Song was awful in his positioning, thus giving VDV ample space to cause damage. I did not realize the effect of this defeat until I tried surfing the web I discovered that I could not visit my usual football sites without being greeted with comments and views on the game. I was in deep pain and the only respite for me was Chelsea’s loss to Birmingham. In statistics though, you’ll learn that both events are independent and mutually exclusive! My worry now is how we respond to this defeat, our 3rd at home in November. If this home run continues, we should expect 3 more defeats (Chelsea, United and L’pool). 6 home defeats and we DEFINITELY won’t win the league title. Are there any positives? Yes. Chelsea lost their 3rd league game in a row and we are still only 2 points adrift the top of the table. The players have been in the press talking of how important it is to respond in the game against Braga. We need to do that in style, and even if we do beat them 10 zip, it still won’t remove the fact that we have no record to hold over the Spuds any longer. How sad? Roll on Tuesday, I can’t wait for us to get a huge win so the ghosts of Saturday’s game can be partly exorcised. One thing is for sure though, the scar of that game will be on the mind of every gooner…except of course we in the league come May. It’s a cold day in Accra today, very weird that is. I’m off to get some breakfast and prepare myself for a barrage from my Arsenal-hating pals. Not my best of times you bet. From wherever you are reading, look for positives. I’ll be doing the same all day. That’s the question I asked myself as Mike Dean blew the final whistle to end what was a miserable afternoon for everyone associated with the Arsenal. We had just lost our second home game of the season, in November, to Newcastle? We cannot blame injuries this time around because for the first time since I can remember, we had over 8 of our starting eleven present on the pitch. Neither can we say it was fatigue because we had all our “best” legs rested over the week. We cannot blame the referee because it’s not like he made a wrong penalty decision, wrong offside decision or that he blew the full time whistle on 80 minutes? So what went wrong? Personally, I feel we underrated them. Yes, we rolled them over last week, away from home, so we are going to roast them at home. I’m sorry guys, football isn’t Math and it just does not work that way. Granted, Fabianski could have done well on the set piece but we had a whole half to turn the result around do or at least grab an equalizer. But NO, we kept playing the ball over the top, playing to Newcastle’s strength. Everyone gave a flat performance and we paid dearly for it. Never have I seen Cesc perform so badly, so badly I wanted him changed for anybody on the bench. It cannot get any worse than this, I thought to myself. But thanks to the Scousers, we are still 5 points behind when it could have been just 2 points. We are now in 3rd place level with the Billionaires and 3 points behind the Mancs who had possibly their best weekend of the season. The only good news for us is that the Spuds lost to Bolton. They must have been sapped following their heroics against Inter Milan. We need to stop this habit of keeping it late, get an early goal and rest everyone’s nerves. It neither does nor suits everyone to be on the edge of their seats waiting for a goal that should have come long ago. We lost at home to WBA and now Newcastle, and even though I am optimistic, we seem to be throwing away our chances of lifting the trophy. Don’t get me wrong, it’s still well within reach, but performances like this only make it a dream. Let’s hope it does not repeat itself. I’m done ranting, we have Wolves away in 3 days, and we need a great response from the lads after two really poor performances. We need to show everyone that yesterday’s game is not more than what I think it is…a mere blip. Let’s see what we’ll get. Comments Off on WHAT WENT WRONG? Oh well looks like its another start-stop-season for our skipper, but the return of Wilshere to the first team is a welcome boost and after signing a new contract that trippled his pay, a goal and 2 assists shouldn’t be too much to ask for. Then again Shaktar are no mugs, especially on their own turf. Song won’t be able to continue his goal scoring run as a slight knock rules him out and his place will most likely go to the fit again Diaby. Arsh is missing as well and truth be told I’m happy, sub par performances from someone who cost much isn’t pretty. We really need to show more of grit and determination tonight in a very vocal and intimidating stadium, as a victory guarantees us qualification. AW is banking on Theo to give a scintillating performance after sayin he has the potential to better Henry but asked him to keep his feet grounded. Shaktar would probably remain unchanged with Eduardo starting the likely change. And NO I don’t want him scoring again. With Fabianski in high spirits and playing well it should be easy, so long we convert most of the chances we create. Possible Lineup : Fabianski, Sagna, Koscielny, Djourou, Clichy, Wilshere, Diaby, Walcott, Nasri, Rosicky, Chamakh. Jackie gives ’em just what they wanted: Birmingham thoughts. Coming in a week when Wenger called for a meeting between managers and referees to look into horrendous tackles, our own youngster gave the press something to throw back in Arsene’s face. Wenger has lost a couple of his players to brutal challenges from opponents and has been on the fore front of a “stop violent tackles” campaign. Yesterday’s events will definitely prompt the press to infer that Wenger has to put his house in order first. I have seen the tackle over and over again, and it certainly deserved a red; whether it was intended to hurt Zigic is something only Wilshere can tell. However, the good thing about the whole issue was his reaction to the sending off. “I just want to say that I mistimed the challenge on Zigic and accept that I deserved to be sent off…I have no complaints about getting the red card and I will learn from this”. This is the sort of response we expected from the likes of Shawcross and Taylor, but what we got was a vindication of their actions. Great stuff lad, you are becoming a real man once you can take responsibility for your actions and not run away from them. The game itself was a beauty as we totally dominated proceedings. We created chance after chance but were very unlucky to go behind in the 33rd minute when Zigic met a Fahey cross with a towering header past Fabianski. Not again…I thought to myself; the West Brom game definitely was not going to repeat itself. I just could not imagine us losing again to a team we would normally beat. My fears were allayed when 4 minutes before the break, a lovely run by Wilshere was halted in the box. Marouane picked up the bits of the loose ball and was felled by Scott Dann. The referee simply had to give a penalty, and up stepped our man of the moment, Nasri to fire past the keeper. One-all, and I knew we were going for something more. By the way, this is like the 6th penalty Chamakh has won for us, not really a bad signing eh? The second half had barely started when a beautiful move involving Song and Wilshere sent Chamakh free, but he had to do a lot of maneuvering and body positioning to beat his markers, the keeper and slot the ball into an empty net. We had the lead now, deservedly and most of the possession. there was no way we were going to lose this one, not if there was no flappyhandsky moment. Speaking of flappy hands, he seems to have gained some sot of confidence. He was not at fault for the goal, his handling was assured and his decision-making was generally okay. My highlight of the game was the sight of Nikky B on the sidelines replacing Chamakh for his first game of the season. He was welcomed to a rapturous applause and almost got himself on the score sheet within minutes of coming on. Both Rosicky and Nasri also tested the Birmingham keeper before Wilshere’s moment of craze! I’m done talking about that, so it ends there! So, it ends, 3 points to the Gunners, and a win for Arsene on his 800th game in charge. On a weekend that both the Chavs and United dropped points, a win is just what we needed. As I type this, the Scousers are losing their derby to Everton. I really pity them now, jokes aside. A few positives, very good games from Diaby and Wilshere, Chamakh giving us just what we lacked upfront. We have Nikky B, Ramsey and Theo back, Cesc will join soon, R.V.P isn’t far away either. We move to second place, ahead of United on goals even a win for Citeh will push us down one more place. Not too bad, considering we were literally in trouble two weeks ago. So we are back in business it seems, more point dropped by any of our rivals can only help our cause. But for now, we need to keep our side of the bargain and keep winning our matches, starting with a whitewash of Shakhtar on Tuesday. C’mon Gunners, let’s do this!